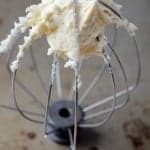 This is the best Vanilla Buttercream Frosting recipe. Make this easy buttercream frosting recipe and you'll never want cake without vanilla buttercream again. To make frosting, beat the butter until fluffy. Then add the powdered sugar gradually, one cup at a time. Add in the vanilla and milk.